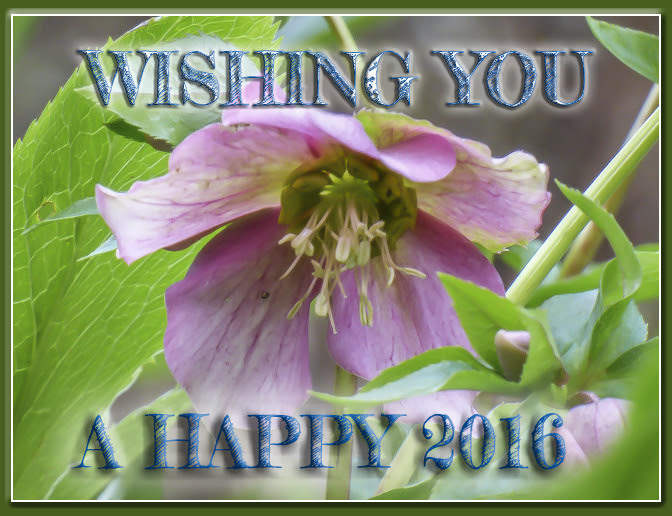 This year what better flower to choose to wish that 2016 brings everything all my visitors would want for themselves. 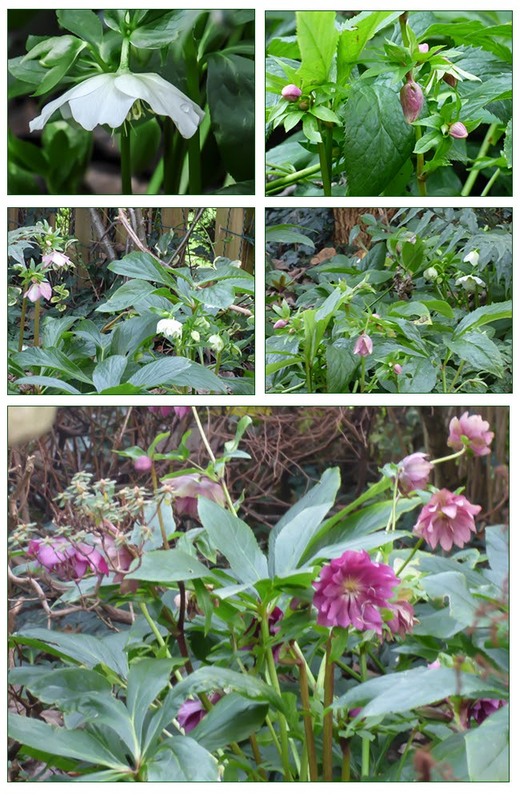 You may remember that in an earlier post I was pondering the misnomer of the names Christmas Rose and Hellebore Niger. Well I've been doing some research and found one or two things on the Internet which try to explain what seem to be inappropriate names so I have updated the post here with some snippets of what I found out. 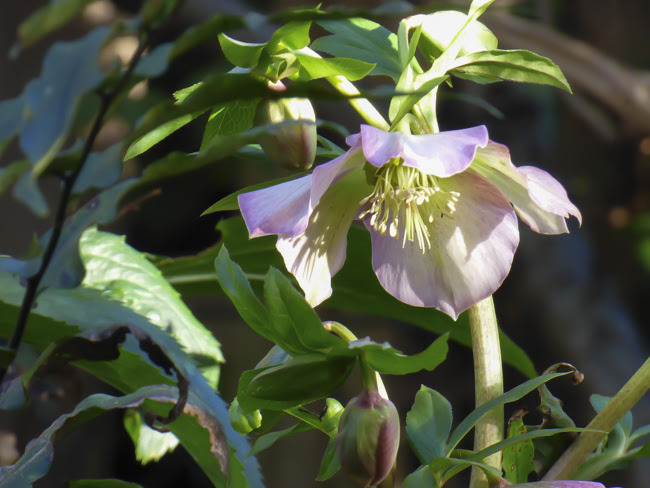 Now I wonder why the hellebore above is sometimes referred to as the Lenten Rose? 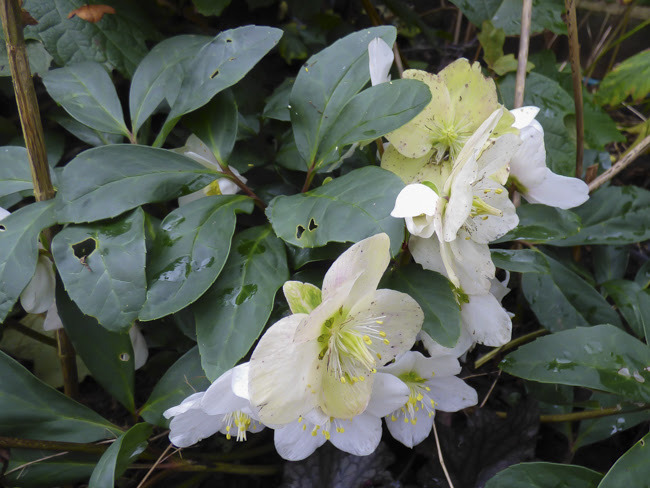 I've always thought that Helleborus Niger - the Christmas Rose was inappropriately named on several counts. 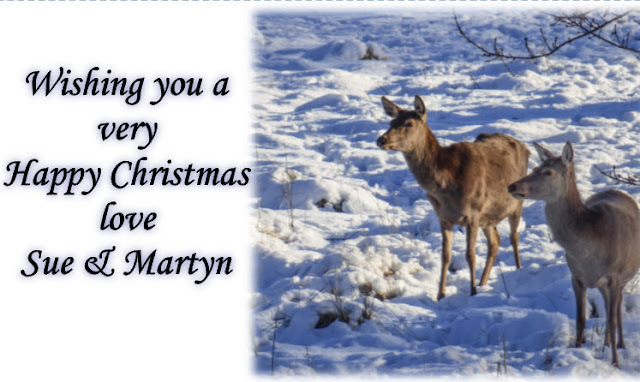 Despite featuring in many Christmas cards - it doesn't flower at Christmas. 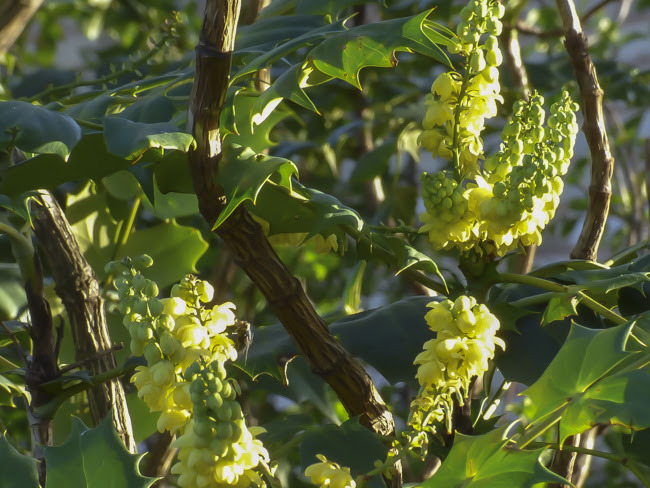 This year it is living up to the Christmas handle and as in many other gardens ours is in full flower. Some flowers have even already gone over and it is a pity soil has splashed some of the flowers but the plant has flowered better than any previous year and avoided slug devastation so we can't have everything. The other hellebores are also beginning to flower. 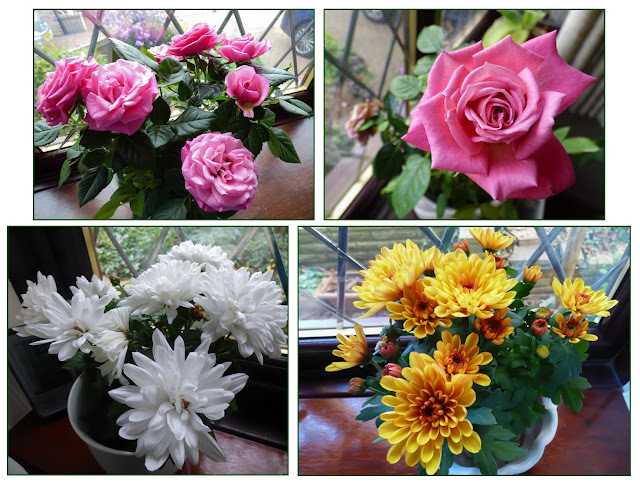 Early flowering of plants has been put down to mild weather but is it more complicated than that. Plants can be artificially triggered into bloom by changing the light levels to simulate different day lengths and they also respond to fluctuations in temperature. 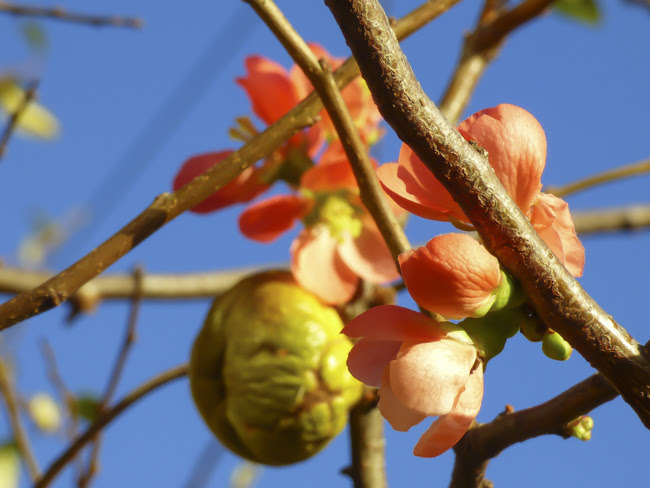 So maybe the early flowering is more complicated than it simply being in response to the mild winter. Apparently the origin of the name Christmas Rose comes from a legend whereby a young shepherdess was weeping as she had no gift to offer baby Jesus. As her tears hit the snowy ground they changed to pure white flowers. An angel appeared and told her there was no better gift for the baby than the pure white flowers that sprung from tears of love and devotion. The best answer I can find for the reference to black is that it is because the roots are dark but I don't intend to dig on up the find out. 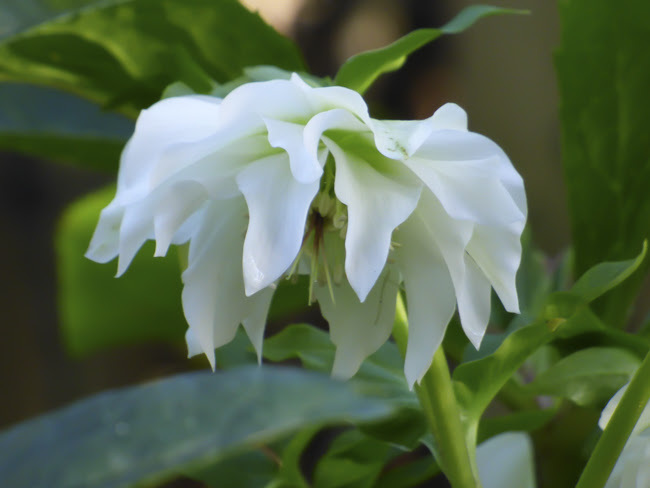 More references to the history of hellebore niger can be read here. After several weeks absence we managed a visit to the plot on Sunday with a certain amount of trepidation. Would the gales have swept the greenhouse and shed away? We were fairly confident that we wouldn't have any serious damage as a plot neighbour, concerned over our absence, rang us after the worst of the winds and he would have certainly let us know of any real problem. Less certain was whether we would have anything left to harvest. 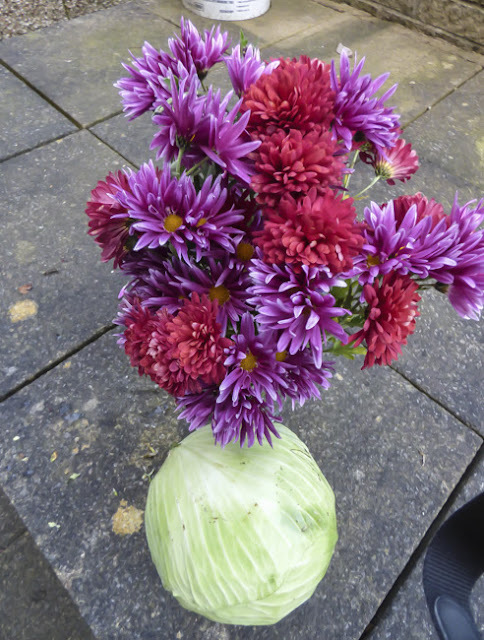 Unfortunately we had missed our cauliflowers and the chrysanthemums had just about finished flowering but we did come away with some goodies. The harvest collection isn't as photogenic as usual as we decided to take most of the vegetables home almost as they came out of the ground. We have found that root vegetables seem to keep for longer this way. 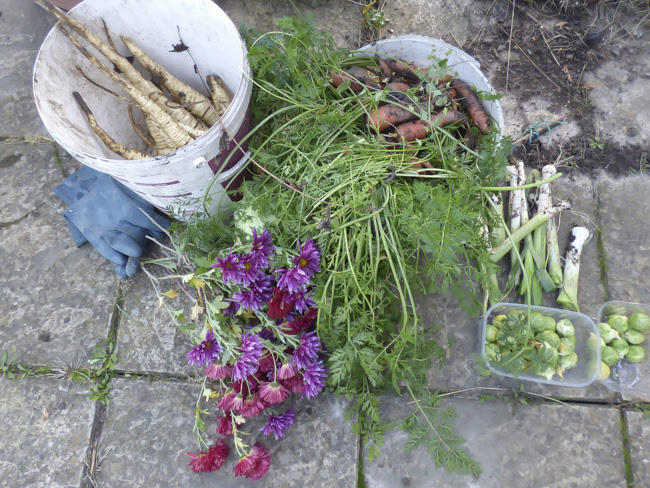 One disadvantage is that the condition of the roots isn't as obvious and so we harvested a bucketful of carrots. We have more carrots left in the ground but thanks to slugs nothing like as many as usual. You may remember that our first two sowings were munched into oblivion and the third sowing was relatively late. The parsnips growing alongside the disappearing carrots fared better - slugs obviously don't like them as much. We still have quite a few in the ground but you can't count your parsnips until they are out of the ground can you? It was very dry when the leeks should have been planted out and so they went into the ground late and are much smaller than usual. I don't expect that they will grow any more now so we will just have to use more at each serving. Did you spot the cabbage in the harvest group photo? It's just peeping out from under carrot foliage and chrysanthemums - an oversight of whoever arranged them but I do have an excuse at the moment being visually challenged. I'm using the same excuse for the photo below. The cabbage has ended up looking like a vase here. Disappointingly our red cabbages didn't fare well. They also were late being planted and consequently the plants became leggy and struggled once in the ground. I am hoping that we have some of last year's braised red cabbage left in the freezer. 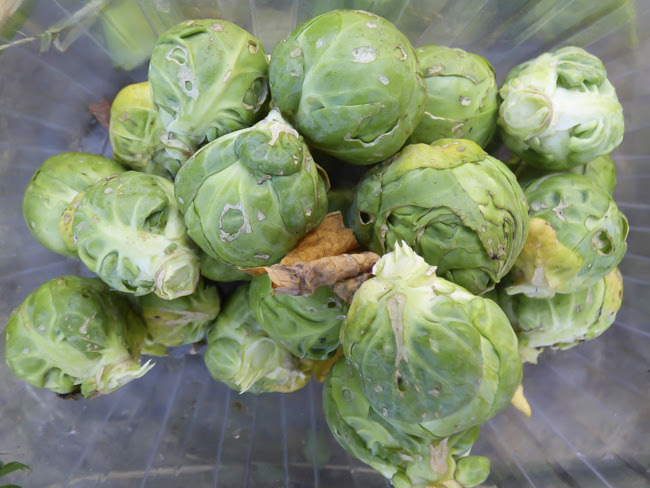 We do have sprouts that fortunately hadn't blown. They may look a little ragged but then again our homegrown ones always do and will be fine once the outer leaves have been removed. 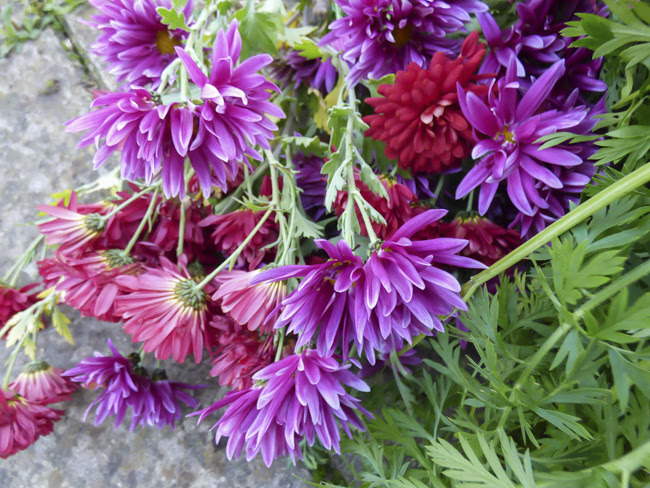 Finally although the yellow and the pale pink chrysanthemums were over, I managed to pick some red and dark pink flowers. I've cut back the other two plants in the overly optimist hope that they may produce more flowers but don't realistically think this will happen. Having decided that the eye surgery was too risky, I forfeited my, not inconsiderable, deposit and withdrew. My aim now is to try and source some contact lenses that I can wear comfortably and glasses that don't require scaffolding to wear without nose fatigue but don't make me look too scary. I'm also looking for advice on managing my dry eyes. This left me searching the Internet for someone who may be able to help with my eyesight issues. I came across an independent optician that seemed as though they may just be able to help. 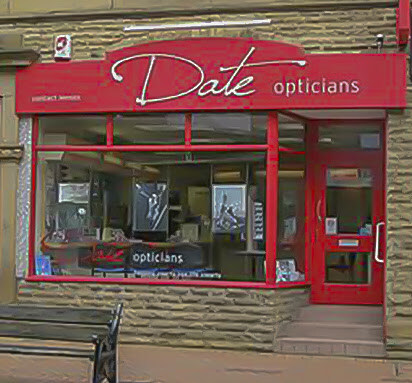 I was surprised to find that the optician was actually only a few minutes drive away in Ossett town centre. It was down a street we rarely walk down and maybe even if we had it wouldn't have warranted a second glance. As a first step I emailed explaining my problems and quickly had a reply saying that they could supply me with thinner lenses for my glasses prescription - something that I was told was technically impossible by several large lens manufacturers - so I made an appointment. I was told to take along everything I had relating to my eyes so, Martin, the owner/optometrist could get an idea of the present position. After a long conversation and telephone calls to my previous optician (belonging to a large chain) with requests for information to be faxed across, my prescription was reassessed and found to have changed very little despite being eight weeks without contact lenses. It was decided that this appointment would focus (no pun intended) on sorting out some better glasses and that a second appointment would work on my dry eye problem and contact lenses. I was then passed to Rachel, the dispensing optician who had already been researching lens options for me. She explained that she could source thinner glass lenses but that ironically because the glass was denser they would be heavier. 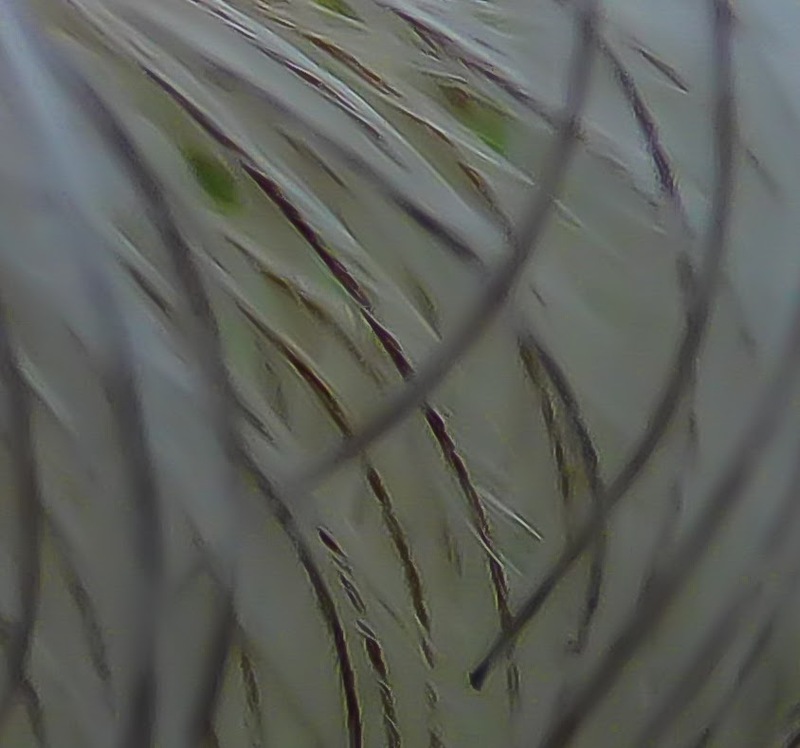 Another option was blended lenticular lenses in plastic which would be lighter although could look a little strange from certain angles. I decided to give these a try. Rachel rang the manufacturer for advice on the type of frame that would be best and then we chose a frame ( I actually got to choose a frame rather having the choice of two at my previous opticians when my first selection was rejected as unsuitable after being sent to the lens supplier and returned by them). My new glasses should arrive after Christmas and I have also booked my contact lens/dry eye appointment. Apparently there are lots of different types and materials of lenses so Martin is hoping to find one that suits me and he also specialises in managing dry eyes. So fingers crossed again - at least this time I was treated like a person rather than the owner of a pair of problem eyes. My appointment actually lasted over two hours. It will be a while before I find out whether this time things will work out but I think I have found someone who will try the best that they can for me and I can't really ask for more can I? Hoping to manage a plot visit tomorrow for a much needed harvest. 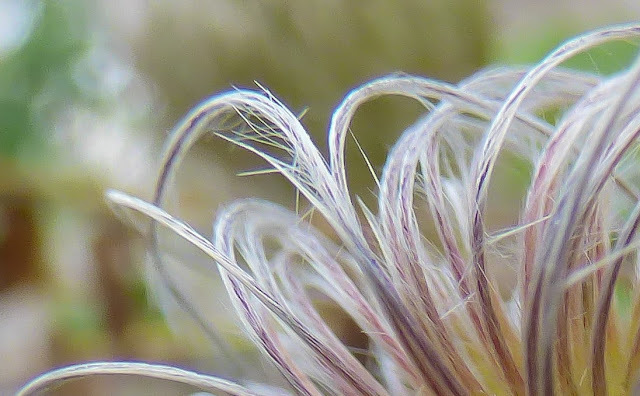 With a bit of luck I can get back to garden blogging before more followers pull the plug on me. Many gardeners describe their garden as an extension of their home or as an additional room but it can also be the other way round and your home can become an extension of your garden. I have never lived in a house that didn't have indoor plants. As a child I filled our home with spider plants, took numerous cuttings from busy Lizzies and 'geraniums' and brought plants home from school to look after during the holidays. Often these generated offspring and I added aloes and Bryophyllum daigremontianum (neither of the latter were choice plants but fed a childhood fascination for the ease in which one became many). When my sister came along she followed suit. Martyn also grew up in a house filled with plants and so it was only natural that our home would also have house plants and has continued being an extension of the garden. 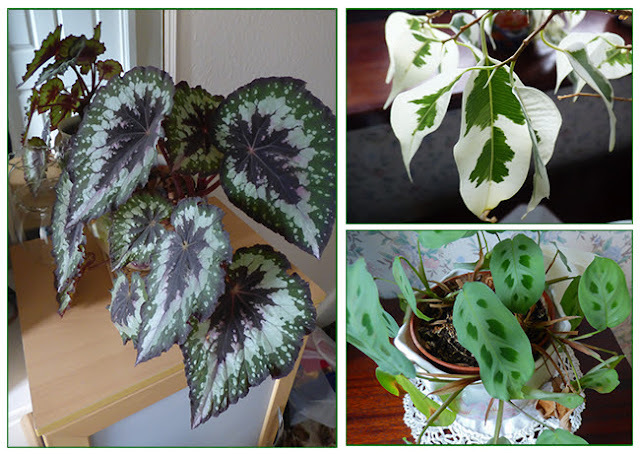 Over the years the types of plants housed have changed - there seems far less choice of readily available house plants these days. 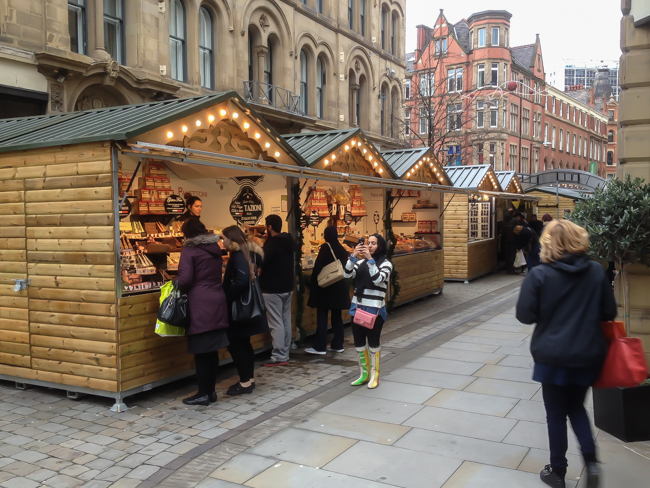 Little opportunity to acquire something out of the ordinary as supermarkets have become the main suppliers. We were attracted to a small rose when visiting a small local garden centre. 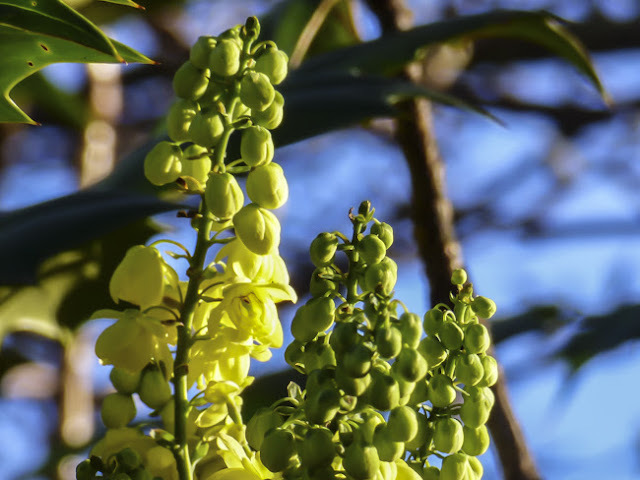 The scent drew us towards it and the knowledge that when it outgrew house plant status it could be rehomed in the garden. Regular readers will have read how potmums also have a second life as cut flowers and my latest colour acquisitions were made with that in mind. 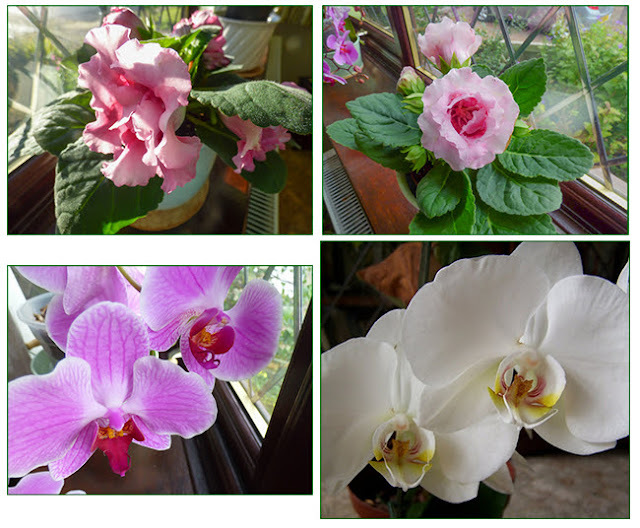 The gloxinia below was bought at the same time as the rose . I've read that it is best to discard the plant after flowering but I intend to give it a chance to flower again next year. Patience paid off when, after several years, ours orchids flowered again. 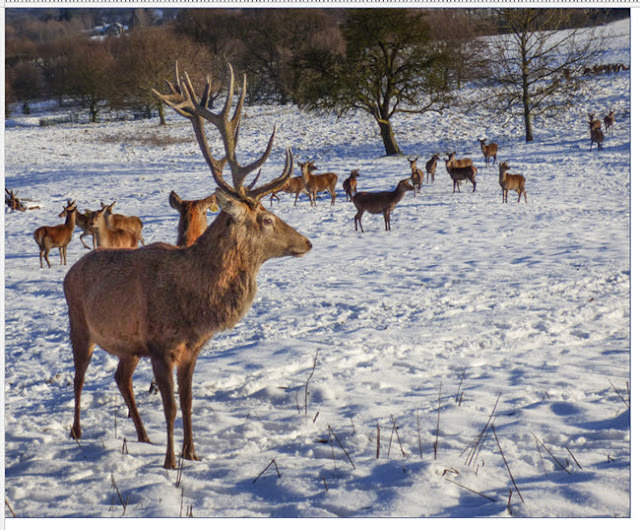 Just think what we would have missed had we thrown them away. 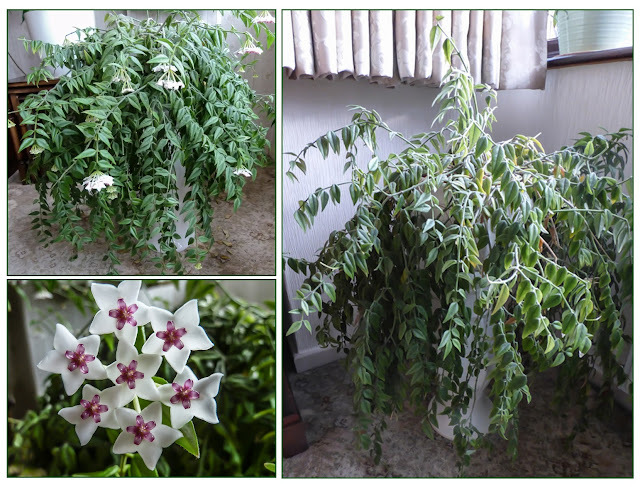 Our hoya is quite a few years old. It's not a spectacular plant but the flowers are really pretty, especially if you lay on the floor and look up at the blooms. Maybe a hanging basket would make life easier but also maybe far messier. We have quite a collection of streptocarpuses, some inherited from Martyn's mum. 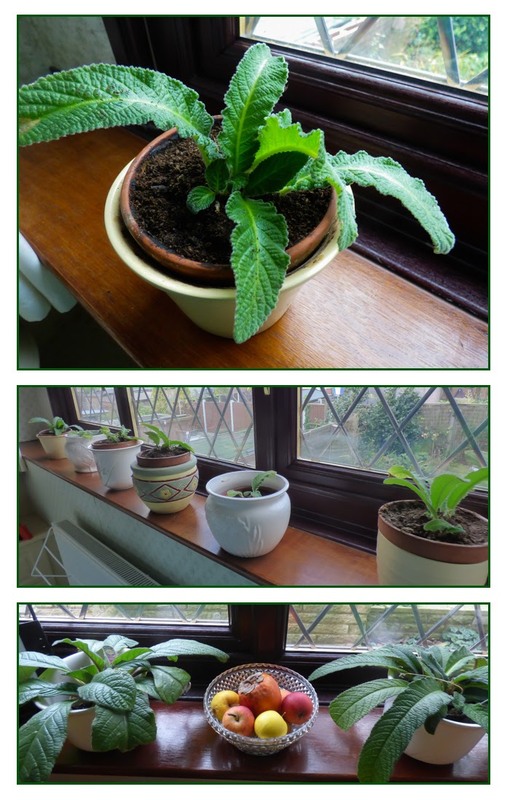 I have recently tidied them up and repotted them except for two newly bought this year. 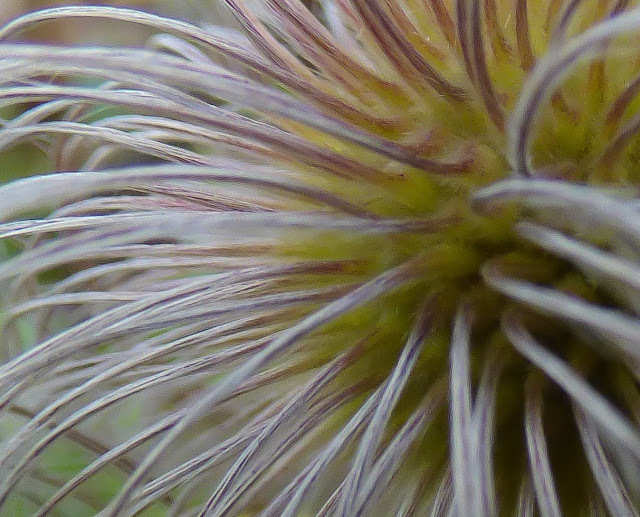 They have no flowers at the moment but below is a photo of one flowering earlier in the year. 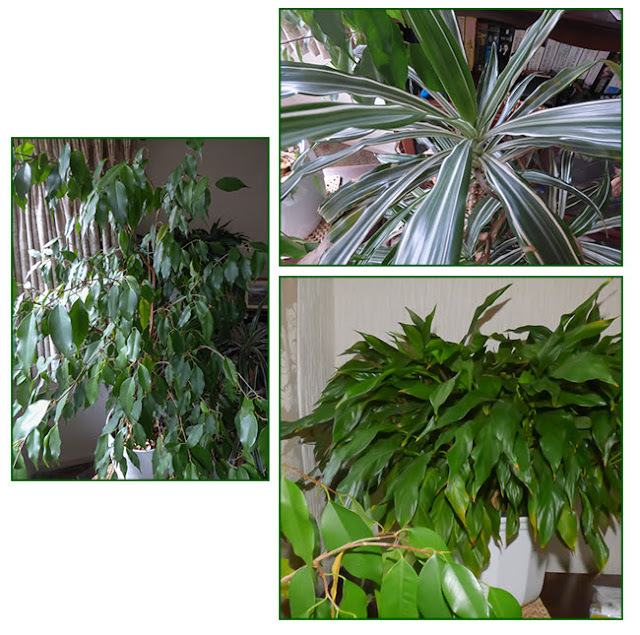 A ficus in the living room is becoming a tree and the only way to dust it is to give it a shower. Dusting each leaf would be a full time job. The dracaena like Dr Who has undergone several regenerations as if the leaves become too tatty, I cut it down. We have several peace lilies many because they often need splitting and there is a limit to how many can be given away. 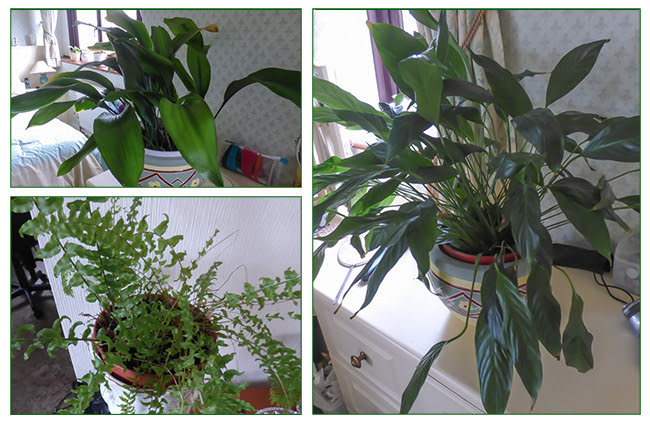 Another inherited plant is an aspidistra. This belonged to my grandma who had also inherited it so it will easily date back to the Victorian era. 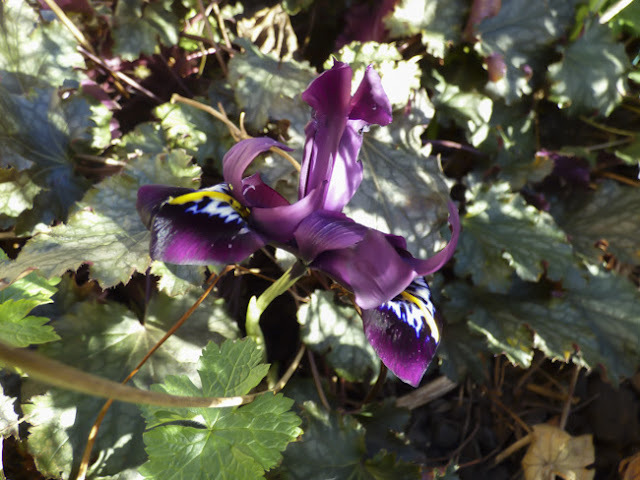 When I inherited it, it had one leaf and was planted in smelly compost due to may grandma's habit of watering it with tea complete with milk and sugar. Once replanted it grew very quickly and my sister also has a large plant. Many years ago it produced a flower but I am still waiting for a repeat performance. The Boston fern often needs a tidy as to be honest it isn't growing in ideal conditions for it but is holding its own. Another plants that isn't growing in an ideal position is one of our clivias. Roger - the No Dig Gardener chastised me for growing it in insufficient light but I liked the dark green leaves that the low light produced and despite the lack of flowers liked it where it was. 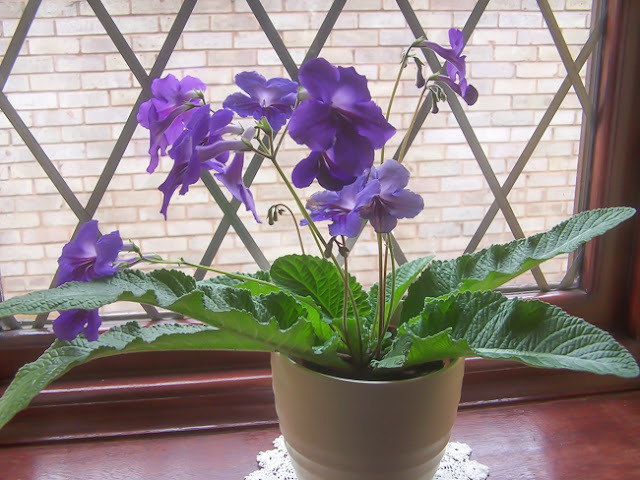 The result was that Roger gave me another plants that I have grown on a windowsill and as a result last year it flowered well. 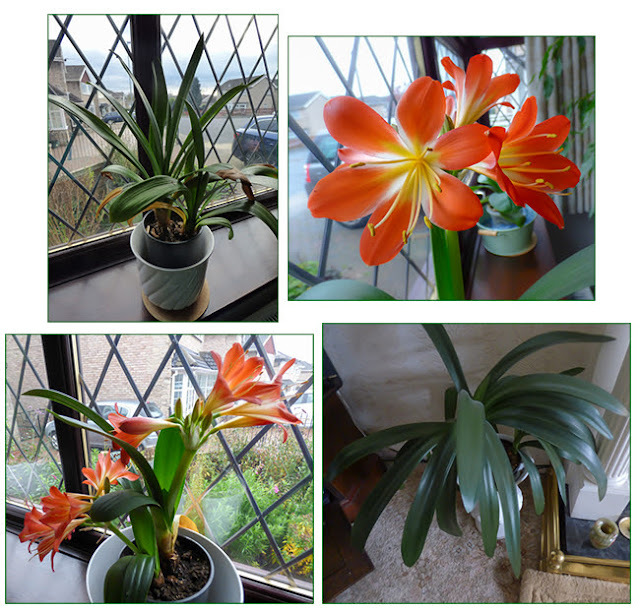 It spent summer in the greenhouse and has now been brought back into the house in the hope of flowers again this year. Plants such as begonia rex and the prayer plant produce flowers but we grow them for the foliage. Both respond to being cut back when the leaves become tatty, in fact it seems to be part of the prayer plants yearly growing cycle. Dead leaves are cut off and new ones grow from the centre. The plant in the photo below is coming to the end of the cycle and new leaves should start to push up soon. The variegated ficus is stunted due to being kept in too small a pot but still keeps going. We are great believers in giving plants a chance to regrow and currently have a few plants in the recuperation suite. At present these are all plants that have finished flowering and have been cut back hard. There are several regal pelargoniums, a busy Lizzie/impatiens and a begonia. 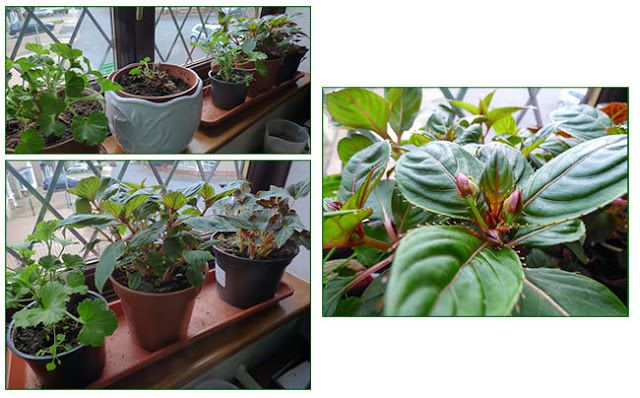 The impatiens had been attacked by aphids which we couldn't control and so cutting down was a last resort which has paid off as it had grown well and has lots of new flower buds. So our outdoor garden may be heading for a long sleep but our indoor garden is thriving. Many of our indoor plants are garden plants in other parts of the world. Malar and Endah grow many in their gardens. Many house plants given the chance are long lived and so are not just for the short term and deserve a life. In the comments on my post about my eyesight problems many of you requested that I keep you up-to-date with any progress. I'm afraid the news isn't particularly optimistic. I attended a consultation in Manchester regarding the possibility of lens replacement which seems to be my only option. The procedure sounded to be very straightforward and safe and it would give me almost perfect eyesight without the need for glasses or contact lenses. After extensive tests on Friday, it was revealed that my eyes are very long and therefore there is a high risk of retinal detachment if I go ahead with the surgery. In fact the advice was that I should think in terms of when the retina would detach rather than if. The surgery involved is the same as it would be for a cataract operation and one of the comments was that it wouldn't be considered for me if I was younger due to the level of risk. 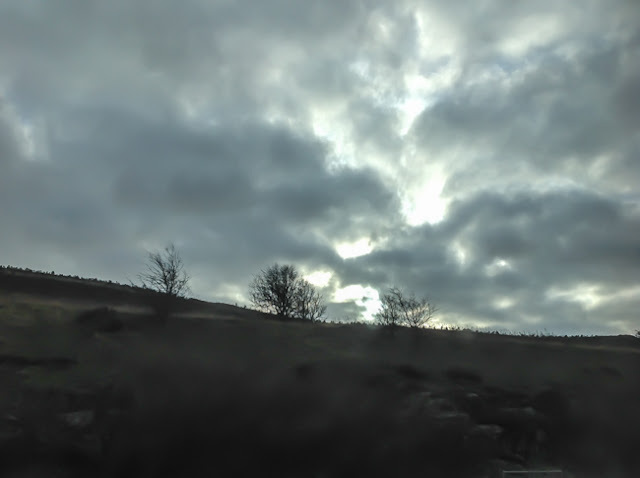 The reason behind considering it for me was that at some time it was certain that I would need cataract surgery even though at the moment I have no signs of any cataracts developing. Apparently that the result of living longer is that we will all end up with cataracts. The thing is that this point, if it is reached, could be a good few years off. I have been referred to another ophthalmologists who specialises in retinal issues but to be honest the whole discussion scared me. It seems that the best advice he would give would be to proceed with extreme caution. It seems that there is a very high risk involved and so I am left with the dilemma of what to do. At the moment I feel the risk is too high as any type of eyesight is better than none at all. I just wish the optometrist had told me that the whole thing was too risky and that it couldn't be carried out. I guess the bottom line is if I make the decision to withdraw I lose my deposit whereas if they make that decision I get my deposit back. Am I being too suspicious in thinking this is why the decision is left to me? I am now trying to investigate if there are any other options. It's all a bit traumatic. Fortunately at the back of my mind I had the feeling that something would put a spanner in the works, it's just the fact that they seem to be saying we can do this but there WILL consequences that is difficult. At least I am learning how to use speech recognition instead of typing. 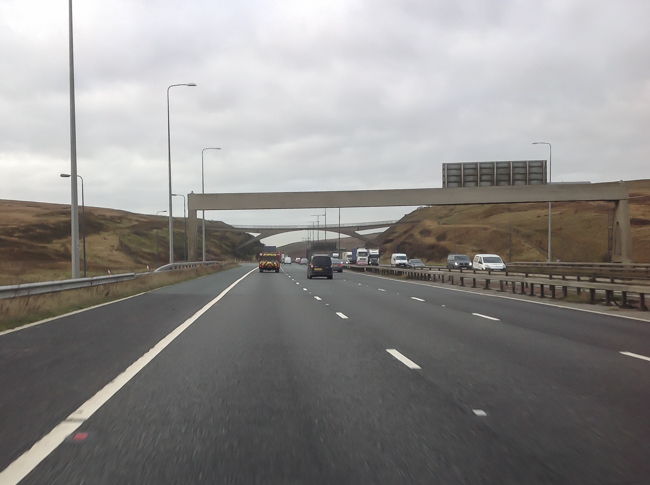 I can take photos though and have added some of our journey across the Pennines and the Christmas market in Manchester to stop the post being too miserable.